Texas bluebonnets, landscapes, and rivers. Mesquite tree with Bluebonnets: Willow City Loop. While driving along the iconic Willow City Loop, I found this mesquite tree that caught my attention. This area around the Mesquite tree included a variety of spring wildflowers, that most noticeably the Texas bluebonnet and phlox flower. The area in front and beyond the mesquite tree is private land, so I did my best with the limited space to work with. 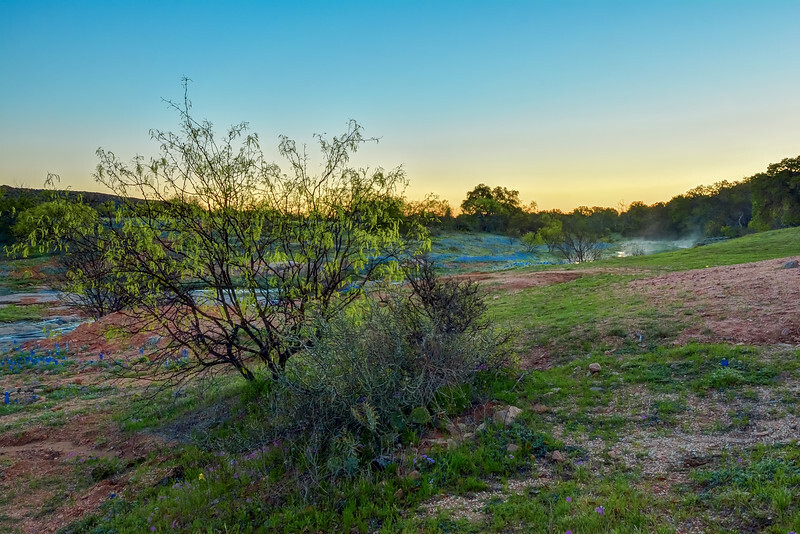 As one can see in the background, there is a sea of bluebonnets near the water's edge, with a patch of early morning fog rising to the right in this photo.